Only "Saturday Night Live" could bring together two stars linked to a hit song. In one of last night’s "SNL" skits that references Green’s song, Paltrow played a music exec who rattled off the words “forget you” in her sentences, subbing for what would have been expletives. Green also made an appearance in the sketch as himself and reacts negatively to the FCC’s attempt to squash his song. Paltrow also appeared in several sketches. On the 1964 “Secret Word” game show, she portrayed a clueless socialite guest competing against fellow panelist Mindy (Kristen Wiig). Speaking with a German accent, she played a not-so-keen-on-current events Heidi Klum auditioning for the co-host spot on the CNN program “Parker Spitzer” with former New York Gov. Eliot Spitzer (Bill Hader). And In a Spanish-speaking version of ESPN's Sports Center, Paltrow portrayed co-anchor Sofia Cortez delivering news about Brett Favre’s texting and describing some of the top 5 recent game highlights. On the SNL Digital Short, Andy Samberg meets the real Pee Wee Herman (Paul Reubens) in a bar where the two engages in rounds of shots, then go on a mechanical bull, and then do Herman’s trademark dance to “Tequila” on top of the bar. After playing a vicious prank on Anderson Cooper (who appeared as himself) on the street, the two drunken men are forced to stay away from each other by concerned friends--it reaches a happy conclusion involving more drinks. For Weekend Update, guests during that segment included the Rent is Too Damn High Party candidate Jimmy McMillan (Kenan Thompson) and musical act Garth and Kat; "SNL" cast member Vanessa Bayer interviewed Christina Aguilera (Nasim Pedrad) and Cher (Hader) at the Golden Globes. The next new installment of "SNL" will air Jan. 29 with guests Jesse Eisenberg and Nicki Minaj. 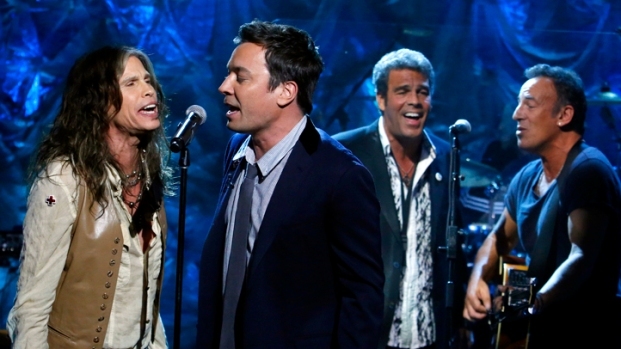 Sources: Hulu.com, "Saturday Night Live" broadcast Jan. 15, 2011.